Steven Spielberg’s film career takes center stage in SPIELBERG, Susan Lacy’s new feature-length documentary. Photo courtesy HBO. Directed and produced by Emmy and Peabody Award-winner Susan Lacy, Spielberg traces the filmmaker’s evolution from pre-pubescent movie geek to wunderkind industry insider. Lacy has a big story to tell, and she’s clearly up to the task. She makes good use of all the bells and whistles she fine-tuned during her decades-long stint as creator/producer of the long-running American Masters series on PBS. Steven Spielberg was in his early 20’s when he had the audacity to direct movie queen Joan Crawford in an episode of TV’s Night Gallery (1969). He hit the jackpot with the now-classic Made-for-TV thriller, Duel (1971). Drew Barrymore and her new best friend, E.T. THE EXTRA-TERRESTRIAL (1982). There soon followed a dizzying array of feature film epics (Jaws, Close Encounters of the Third Kind, E.T., Raiders of the Lost Ark, Jurassic Park and various spin-offs), as well as literary and history-based dramas (The Color Purple, Schindler’s List, Amistad, Saving Private Ryan, Munich, Lincoln, Bridge of Spies). You’ll relish revisiting these gems and others via the profuse film and TV clips that thread throughout Spielberg, as the director ruminates about his transition from popcorn people pleasers to thought-provoking dramas, and the influence of his lifelong obsession with David Lean’s Lawrence of Arabia, which is also clipped here. 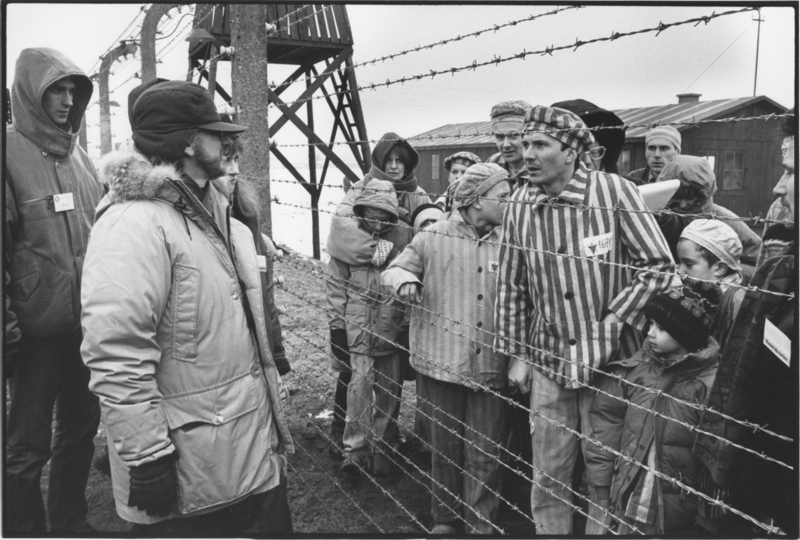 Steven Spielberg directing several actors playing concentration camp prisoners in SCHINDLER’S LIST (1993). Photo courtesy HBO. Steven Spielberg is an ever-present player in this film bio, as are his sisters, parents and film colleagues. We are privy to Spielberg’s childhood peccadilloes and special talents; the timeline and enduring impact of his two marriages and children; and the provenance of common themes in his work. Director Susan Lacy peppers the film with commentary from a dazzling array of Hollywood A-listers: actors, directors, cinematographers, editors, producers and, of course, his longtime composer John Williams. Informative sequences focus on his peeps … guys with names like Scorcese, Coppola, De Palma and Lucas … who piggyback the launch of Spielberg’s career with their own in the 1970’s and ’80s. 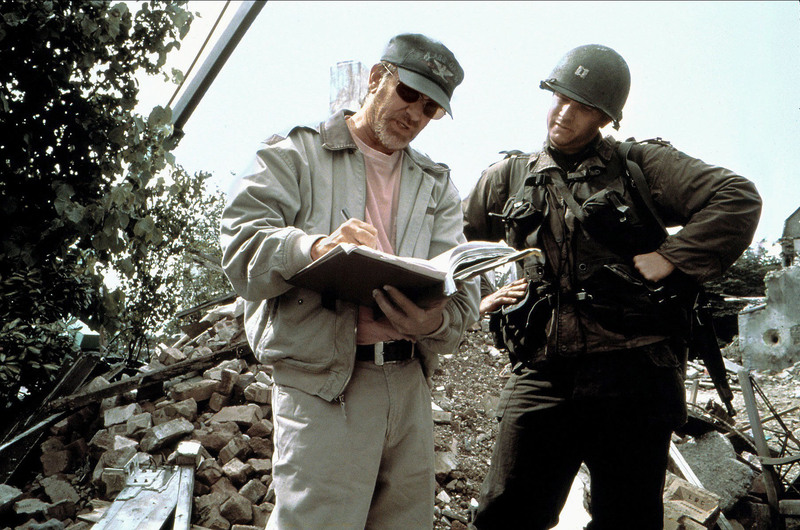 Steven Spielberg and Tom Hanks on the set of SAVING PRIVATE RYAN (1998). Photo courtesy HBO. Spielberg returns repeatedly to the upheaval caused by his parents’ separation and divorce and his lengthy alienation from his father. His heartfelt reflections and those of his sisters and parents, who touchingly reconciled late in life, link his family trauma to themes in his work, as well as the ambiance fostered with longtime colleagues on his film sets. Spielberg’s films clearly map his efforts to address and resolve painful family issues via his very large and public canvas, apparently enabling him to bypass traditional therapy. We should all be so lucky. 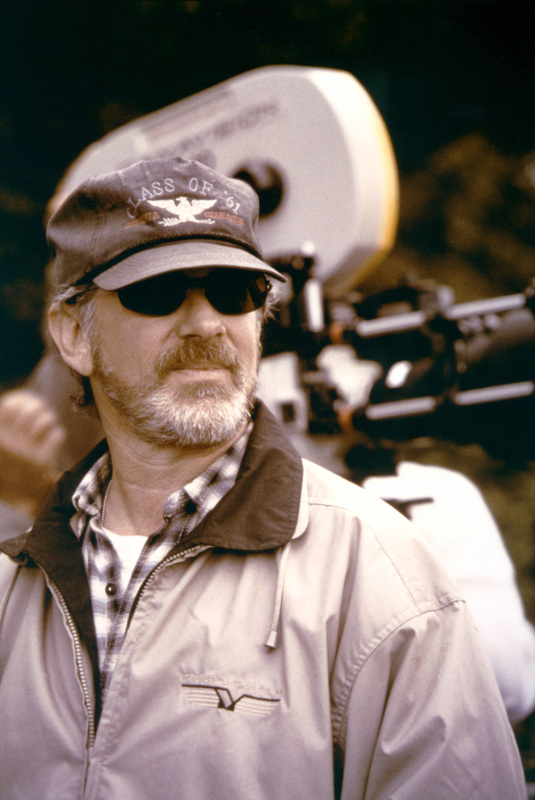 Spielberg tracks his career up through and including Bridge of Spies (2015). It is an exhaustive and respectful film bio that secures Spielberg’s name in the pantheon of great American director/producers. As such, it will have evergreen value in programs focusing on film directors, film history and appreciation, and American cultural studies in high schools, universities, libraries and museums. This entry was posted in Cable, Film, TV and tagged Bridge of Spies, Close Encounters of the Third Kind, Duel, E.T. The Extra-Terrestrial, Film Directors, HBO, Jaws, Lincoln, Munich, Saving Private Ryan, Schindler's List, Steven Spielberg, Susan Lacy. Bookmark the permalink. I thought you’d be writing about this production. I saw it on Thursday at the New York Film Festival. Spielberg was there, but only to stand up in a box with Susan Lacey as the end credits were running. It’s an extraordinary documentary, a little long, but understandably so given the size of his career. Plus it’s very revealing in laying out where he comes from and how that plays into everything he does. The part where he’s talking about “Schindler’s List” and the clips we see almost brought me to tears. It’s fascinating to see the guy who makes wonderful escapist films about Indiana Jones and dinosaurs alongside the guy who makes films such as “Munich” and “Bridge of Spies.” He’s a true phenomenon. Will record it so I can see it agan. Great write-up as usual. Thanks!